Well it’s like an open secret, as most are aware that Apple has been contemplating delivering their iOS smartphone to China’s largest carrier, China Mobile, and obviously Apple want it to happen due to China Mobile’s vast number of possibly iPhone converts, and although Apple does try hard to keep things under their belt, such as old Steve Jobs having secret talks with China Mobile, these things do tend to get out. Thus is the case here with Reuters reporting that China Mobile has met several times with Apple boss Jobs with a view to introducing the iPhone to the carrier. We all knew that Apple has been in negotiations with China Mobile, but this is I believe the first time is has been stated the Steve Jobs has been involved. 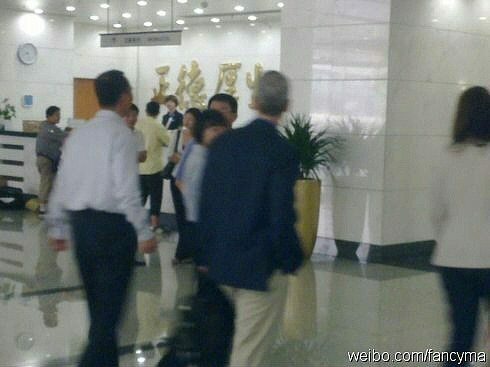 There’s no mention in the report whether the iOS guru travelled to China for the covert chats on bring the iPhone to China Mobile’s network standard, although the guys over at 9to5 Mac suggest Steve could have travelled incognito with Tim Cook on his last visit to China, (could that be Jobs in the image below?) but more likely it was China Mobile execs paid a visit to Cupertino to meet with Jobs. Obviously Apple’s iOS handset doesn’t currently support China Mobile’s TDSCDMA platform although in the past there have been rumours that Apple is looking to introduce a 4G-enabled iPhone 5 for the carrier although that hasn’t been confirmed in any way. Even though China Mobile currently doesn’t offer the iPhone to their customers, there are 7.44 million iPhone users on the network, and obviously Apple wants to expand on that number officially and is thus courting China Mobile. Other than these secret meetings supposedly between Steve Jobs and China Mobile nothing of what happened during said meetings has been mentioned, so for the moment it is still unclear if or when the iPhone will finally hit the world’s largest mobile operator, or indeed whether it will be a version of the iPhone 4 or iPhone 5. However as anything to do with Apple is big news we will of course pass anything along to our readership as and when we hear.